Collection Quality pearls have a surface that is UNLBLEMISHED or what we call CLEAN. In other words, there are no surface markings on the pearls. AMERICAN PEARL is your source for the thickest NACRE (skin) PEARLS IN THE WORLD. Known as the "Collection Pearls", COLLECTION QUALITY refers to the roundest, cleanest most lustrous Japanese Akoya pearls harvested each year from Japan. Each pearl is personally chosen by world-renowned pearl dealer CHARLIE (a modern day Mikimoto), passing a strict grading standard for luster, roundness, cleanliness, pure white bodycolor and the quintessential "nacre thickness" and the coveted "Rose" hue that makes these paragan of pearls known as the "collection pearls". For over 55 years, everyone in America and Japan knows that CHARLIE sells the finest quality Japanese Akoya pearls available in the world. Period. If you are looking for the finest quality Japanese Akoya Cultured Pearl necklace available, with the assurance of knowing that the necklace is indeed Japanese Akoya, you are looking for COLLECTION QUALITY pearls. 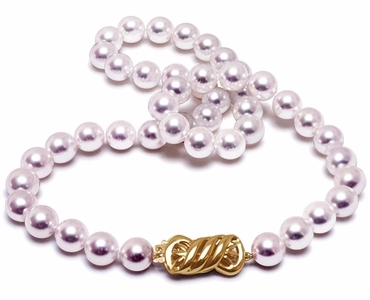 American Pearl feels so strongly about this superior quality pearl necklace that each necklace is accompanied by a PROOF PEARL taken from the necklace that is cut in half to reveal the nacre and a numbered certificate reporting the grading each pearl necklace receives based on its nomenclature. Please click below to learn more.